With the attractions and restaurants of Daylesford and Hepburn spa country only five minutes away, Hollow Log Estate is the ideal getaway for busy people and their dogs. Two-time winner of Holidaying with Dogs' prestigious Five Paw Award, Hollow Log Estate offers a choice of two superb, self-contained cottages set on 23 acres overlooking the peaceful Wombat State Forest (also see listing for Hollow Log Stoney). The spacious and stylish two-bedroom Cottage is decorated with a mid-century feel. With queen-sized beds, one that can be converted to singles, it comfortably sleeps up to four people, making it perfect for two couples, friends or a family getaway. The Cottage is suitable for one or two dogs. Any more than this would need to be negotiated with the owner. The Cottage is surrounded by beautiful established gardens. Enjoy the abundant wildlife from your fenced front balcony, magnificent sunsets over the forest, or take one of the many forest walks from your doorstep. The Cottage comes with all the trimmings for the perfect, relaxing break. A generous breakfast hamper is provided for your first morning and you'll receive a complimentary bottle of wine and chocolate. Hollow Log Estate is truly dog-friendly. Dogs are welcome across the property and inside the cottages. There's a fully fenced, dog play area, dams to swim in and a large outdoor dog bath with hot water. We appreciate that your dog is part of the family. Comfortable and genuinely pet friendly. Our whole family enjoyed our stay. Our family of three people and two dogs had a wonderful weeks holiday at Hollow Log Estate. We stayed in the cottage which is so beautifully decorated and the perfect size for us with everything we could possible need to relax and enjoy our stay. Ali and Lisa were so very lovely and nothing was too much trouble. It was very reassuring to have them close by and they were very accomodating when it came to sharing information about their stunning property and all it's residents (both farm animals and wildlife). We all agreed that it was probably the best and most relaxing holiday we've ever had and we are already checking our diaries for when we can go back. The dogs are still sleeping off all the exercise! We recommend it to anyone who wants a genuinely "pet friendly" holiday! Thank you for your kind review. We're so pleased you enjoyed your week away and that you found the setting as relaxing as hoped. May your next visit come around soon. Everything about the location, the cottage, the host, is amazing. Absolute doggie heaven as well. I would certainly want to stay there again when Im next in Daylesford. Thanks for sharing your review with others. We're so pleased that you and your dog enjoyed your stay. Heaven for doggies...and people too! Staying at this property was an absolute dream. The environment is beautiful in itself, but you can really see how much care is taken to make sure it is incredibly welcoming and easy to navigate for guests. We fell in love with the gorgeous cottage and the breakfast hamper was absolutely delicious. Most important though was how our stay really felt inclusive of our pup Arnold. From a warm welcome with Ali when we arrived to the sweet touch of doggy treats and fresh water inside the cottage and on the balcony, we really felt like the holiday was as exciting for him as it was for us! Not to mention he was ready and waiting to explore the doggy play and dam area at every opportunity! Our stay was just perfect and we highly recommend to humans and doggies alike! We can't wait to get back to this little slice of heaven, very soon! Thanks for your generous review. We're so glad you and your pup Arnold enjoyed your stay and hope to see you again in the future. 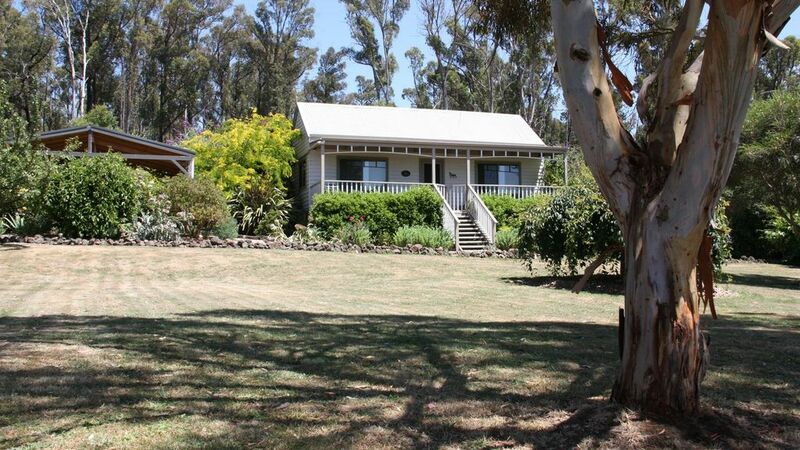 Hollow Log Cottage is located in a lovely, relaxed rural setting, 5 minutes drive to Daylesford. The cottage is very clean and comfortable. The hosts, Ali and Lisa, are most welcoming, and you will feels very at home. Most importantly, Hollow Log is "Dog Paradise"
Thanks for your review. We're so pleased you and your dogs enjoyed your stay. Thank you so much for taking the time to write a review, and for your kind words. We're so glad you enjoyed your stay. I wish you'd mentioned the fire to me as I may have been able to provide some advice. Most guests find it makes the Cottage very cosy in winter, but at least you had the new split system as back up. We look forward to welcoming you again one day.